Eamon O’Shea wants to see an imaginative format being brought in for hurling. Former Tipperary hurling manager Eamon O'Shea. 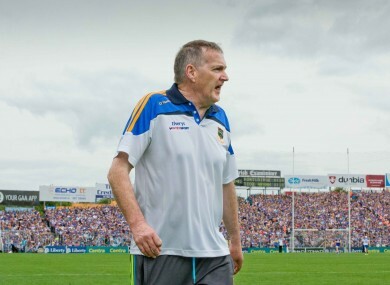 FORMER TIPPERARY MANAGER Eamon O’Shea has called upon the hurling fraternity to be creative in how they respond to the incoming Super 8 structure in Gaelic football. With an increased schedule of football championship matches at a crucial juncture of the season, football’s new system threatens to dominate the small ball from its implementation in 2018. It’s widely expected that the Hurling Development Committee will soon respond with their own template for future championships. O’Shea has called on that group – and the wider GAA community – to look outside the box when it comes to making a new plan. “We need more of a holistic approach for a start,” O’Shea says. “The top counties have a duty of care, a responsibility to the weaker counties and under a new structure that needs to be taken into account. “We are all to busy worrying about ourselves. Someone needs to step up and remind us all to look at the bigger picture. “We also must admit that having a player cosseted in a county set-up, training for a game that is six months away, is not fair on the club, nor is it the best approach for the player either. “And we have to accept that while the Munster and Leinster championships are decent, maybe there is now a need to look at them differently. O’Shea would advocate a system similar to a Super 16 with four groups of four teams playing off to see who would eventually be crowned All-Ireland champions. The former Tipp boss says that would involve admitting counties like Westmeath and Kildare into the top structure. He admits that there could be lopsided encounters along the way, but says he’s not too perturbed about that. He says patience would be needed as the emerging counties build up their intensity and conditioning. “Listen, there are mismatches in every sport and there would be in a system like this too. At the start. But let the teams have a crack, let us promote hurling, and let the lower tier teams get used to the speed and intensity over a five-year period. “At the start can you imagine what a Tipperary team going up to play Kildare would do for excitement levels in the county? Look at the work the people are doing there. “Look at the fight of Meath. Imagine the buzz that they’d get if Wexford came to town. “They might get beaten well but if they keep persisting with the basics, striking and catching, then upping the speed and intensity and incorporating all of those into a controlled coaching environment, then they can make progress. But we have to help them too. “Every system has flaws but one thing is for certain – positive change is soon needed. The hurling community need to be a lot more creative in our next steps forward. “Just because we have always done things a certain way should not mean we keep doing things the same way. “Staying the same and not evolving will not make anything too exciting for supporters and there will be an inevitable drop-off. “I would fear for the game in the future if we don’t change. We’ll be fine next year and maybe the year after. O’Shea says that no matter what template is agreed upon by the HDC or the GAA, the time has come to expose lower-tier players to top flight competition. He feels that even if at underage level, you plucked the 10 best players from a second or third tier county and pitted them in a 10-a-side tournament against divisional teams from stronger counties, it would be a beneficial stepping stone. And O’Shea also feels that the more powerful counties should establish credible training and coaching links with weaker counties and include them in their overall development programme. The Cloughjordan native, who helped his club Kilruane MacDonaghs win an All-Ireland title in 1986 says that the Bank of Ireland U17 Celtic Challenge, which officially starts tomorrow, is a perfect example of what can be done. The competition, which is targeted at 16 and 17 year-old hurlers who are not sitting State Examinations this summer, commences across the country this week and concludes at the end of June 2017. A total of 47 teams from all 32 counties will take part across eight groups – that are determined on a geographical and developmental basis – and feature county as well as regional teams. It means that there will be 1,400 players involved in a programme of 155 matches. O’Shea feels the Bank of Ireland Celtic Challenge offers a window of opportunity to see what hurling can achieve in the future. “It means that those youngsters have meaningful games at a proper time of year,” he says. “They know when the games are on and being part of their squad gives them a shop window to impress coaches of teams they might not have made otherwise. “By that I mean with some counties entering two teams, players who could have slipped by are now more likely to get recognition. “All the counties across the country are hurling. There is an award for Best and Fairest player. “If a team scores more than three goals there are extra points awards. Thinking outside the box! “Development does not happen for everyone at the same time. These players may not have got an opportunity to play otherwise but the Celtic Challenge means that they can develop more in their own time. “It is really good for maximizing potential development and, again, I have to say that it gives us something to strive for at senior level. “There are no long gaps between games, all the tiers are catered for, and down the road things have to change – I would see this competition as being a great bridge. O’Shea, a Personal Professor in the School of Business & Economics at NUI Galway, is one of the leading academics in his field in the world. He has published over 80 scientific papers in refereed journals, including publications in top-ranked journals and has authored or co-authored 15 books and monographs, mainly in the field of ageing, dementia and social policy. His work has been influential in setting the agenda for the reform of services and policies for people with dementia in Ireland. Since he stepped down from the Tipperary job after being involved as both coach and manager in the past, his phone has hopped with requests to get involved with other club and county teams – not that he would ever admit or publicly acknowledge that. He still attends games each week and coaches underage teams at Salthill-Knocknacarra where he lives and says his time with Tipperary was a period of his life that he loved. “I’m still interested in the game,” he insists. “I was absolutely delighted to see how Tipperary went last year and it has been brilliant to go and see them and see what they achieved. “So I don’t really miss it because I am still involved in thinking about the game,” he smiles. “I had a great time but it’s like everything else, your time gets filled up and my work is taking up a lot of time. “We adapt as human beings, we are very adaptable and it’s only when you step back that you see other things and have a chance to reflect. Quiz: How well do you remember the last ever All-Ireland U21 football campaign? Email “'We are all too busy worrying about ourselves' - ex-Tipp boss seeks a 'Super 16' format for hurling”. Feedback on “'We are all too busy worrying about ourselves' - ex-Tipp boss seeks a 'Super 16' format for hurling”.